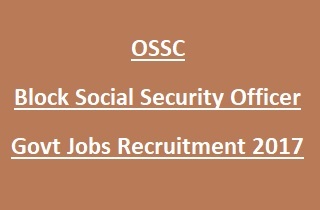 qualifications are required to apply for these vacancies using OSSC Commission website www.ossc.gov.in. Online application forms available from 09-11-2017 to 08-12-2017. Candidate age should be 21 years to 32 years as on 01-01-2017. OSSC Selection Commission will recruit candidates for Block Social Security Officer vacancy based on their performance in Prelims Examination, Main Examination and Computer Skill Test. Short listed candidates from Main Examination and Computer Skill Test will be called for Documents verification test. Pay Scale for BSSO jobs is Rs. 9300/- to Rs. 34,800/- plus Grade Pay of Rs. 4200/-. Applicants need to deposit application fee of Rs. 100/- before filling the application. For SC/ ST/ PWD candidates no application fee. For more details of Odisha staff Selection Commission OSSC Block Social Security Officer Jobs Recruitment Exam- 2017 are given below. Post Name: Block Social Security Officer (BSSO): 151 posts. Candidates must possess Bachelor’s Degree in any stream from recognized University. Proficiency in use of Computer, Word Processing, Internet, E-Mail, Data Analysis & Presentation. Able to read, write and speak Odia. Age limit for OSSC BSSO Jobs is 21 years to 32 years as on 01-01-2017. Relaxations for SC/ ST/ SEBC/ Woman/ PWD/ Ex- serviceman and In- Service Contractual Employees admissible as per Govt rules. Candidates will be selected for OSSC Recruitment is based on following stages. Application fee for all candidates except SC/ ST/ PWD category is Rs. 100/- deposit through online or offline. Aspirants who are willing to apply for OSSC BSSO Jobs are advised to go through the OSSC Commission website www.ossc.gov.in. Before proceeding to fill the application candidates need to pay application fee. Open the website and click on the online application for the post. Complete the registration process before filling the application. After the registration candidate fill all the sections in application and submit before 08-12-2017.